Offering first-class accommodation on the grounds of Hotel La Bisaccia, Nelson Lodge presents eight exclusive suites. Benefitting from all the facilities offered by the 4-star Hotel La Bisaccia, the eight beautiful rooms of Nelson Lodge are situated around 100m from the main complex of the hotel. 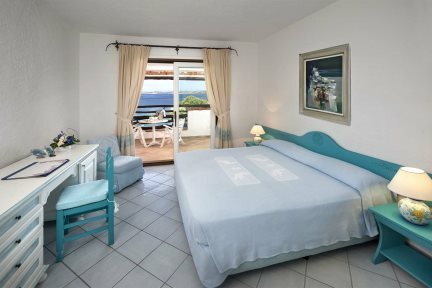 Each sleeping two guests, the spacious and attractive guest rooms are romantic and authentically Mediterranean, proving perfect for couples hoping for a memorable escape in the Sardinian sunshine. Recently built and blessed by some stunning views of the Baja coastline and the distant Maddalena Islands, each room benefits from great facilities, including air-conditioning, satellite TV, mini-bar and a side-view balcony. The great facilities continue throughout the hotel, with the rewarding restaurant and bar ready to keep guests refreshed and refuelled, while the inviting swimming pool is the perfect place to cool off with an afternoon dip. 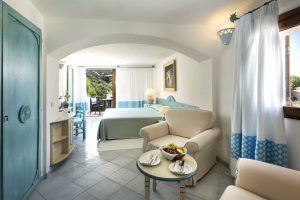 In addition to the rooms at Nelson Lodge, guests can also choose to book a stay in one of Hotel La Bisaccia’s other varying room categories, sleeping from two to three guests and again offering a good amount of space, picturesque views and beneficial mod-cons. Both the lodge and hotel’s setting ensure that many of the finest beaches of Sardinia’s north are within easy reach, while several of the charming and sophisticated villages and resorts of the Costa Smeralda can also be easily discovered during a stay in Baja Sardinia. Seawater swimming pool, four restaurants, pool bar & grill, reading room, piano bar (June to September), Wi-Fi (bar and pool area), concierge service 24H, private beach, beach towels, free bike rental. Also available for a fee: Beach service, parking, babysitter, laundry/ironing service, turndown service. En-suite bathroom with bathtub and shower, satellite television, telephone, mini-bar, hairdryer, safe, air-conditioning, Wi-Fi, terrace or balcony. The Standard room located in the main building is equipped with balcony or terrace, telephone, air-conditioning, satellite TV, mini-bar, hairdryer and safe. The Standard Sea View room located in the main building is equipped with balcony or terrace, telephone, air-conditioning, satellite TV, mini-bar, hairdryer and safe with views to the bay and to La Maddalena archipelago. 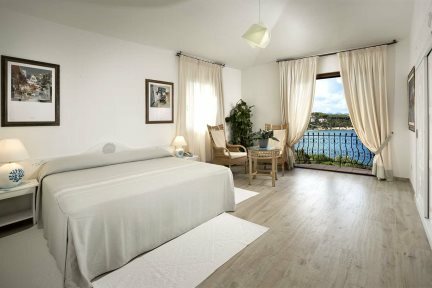 The Nelson Room, located 100m away from the main building in the tranquil Nelson Lodge, offers a more spacious room, equipped with balcony or terrace, telephone, air-conditioning, satellite TV, mini-bar, hairdryer and safe with views to the bay and to La Maddalena archipelago.